Enjoy unlimited travel on the public transport network in Barcelona and its metropolitan area for 2 (48h), 3 (72h), 4 (96h) or 5 (120h) consecutive calendar days. A single ticket that allows you to hop on and off at any of the stops along three different sightseeing routes. Enjoy a night-time tour of Barcelona that will take to the city's most emblematic landmarks. Full- or half-day tours from Barcelona to the main tourist attractions in Catalonia. Cable cars linking the city with the mountain and Montjuïc Castle. A selection of different transport ticket deals to help you enjoy the best of Barcelona. Visit three of Catalonia's best-known wineries in the El Penedès region: Jean Leon, Bodegas Torres and Freixenet. Learn how the different types of wine and cava are made and taste them with food pairings and traditional nibbles. Guaranteed departures irrespective of passenger numbers. Child: free for children under eight (places must be reserved). From 12 November 2018 to 7 April 2019: Thursdays and Sundays. From 8 April to 10 November 2019: Mondays, Wednesdays, Fridays and Sundays. Departs from Barcelona, Plaça Catalunya no. 14 at 8.30 and returns at 16.15 pm. Guided tour of the Jean Leon winery, wine tasting with nibbles and, depending on the season, we will taste the grapes directly from the vine or sample the wine being aged in barrels. Guided tour of the Bodegas Torres winery with a tasting of four wines paired with four traditional cheeses. Guided tour of the Freixenet winery with tasting of two cavas with nibbles. Itinerary: Barcelona > Jean Leon > Bodegas Torres > Freixenet > Return to Barcelona. 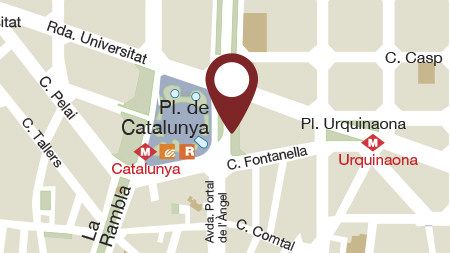 Guided tour in Catalan, Spanish and English. Accessible for wheelchair users. Please give 48 hours' notice prior to departure. Book online and present the voucher to the guide on board the bus using either your mobile device or a printed copy. Please go to the meeting point 20 minutes before departure time. Select date to see prices. Copyright TMB Group 2019. All rights reserved.